Running tree rings around the competition. There are plenty of chip mills around. The problem? Virtually all of them exist to serve the needs of a larger manufacturer. Which means you have to take a number and wait for your order. Create solutions, making things easy for customers like you - Not harder. We have designed our entire operation around your needs. You might even say it is ingrained in everything we do. Not so with Alawood. We exist solely to serve the needs of customers like you with quick turnaround for customized orders in a fraction of the time you've come to expect. From harvesting to processing to shipping, you can count on fast delivery. After all, flexibility and customer satisfaction are how we've grown-generation after generation. At the same time, we at AlaWood believe we are making an impact on our state, our country, and the world by supplying a clean, reliable, and efficient source of energy. 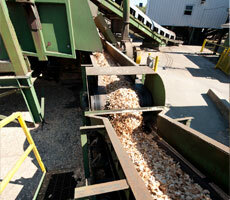 Best of all, through careful forest management, biomass can be a sustainable energy source. And, in times like these, that makes us a growth industry no matter how you look at it. In fact, Alawood has several different organizations, each branch designed to maximize a single step of the manufacturing process. Yet, working together, we create a seamless flow from your initial order to final delivery.